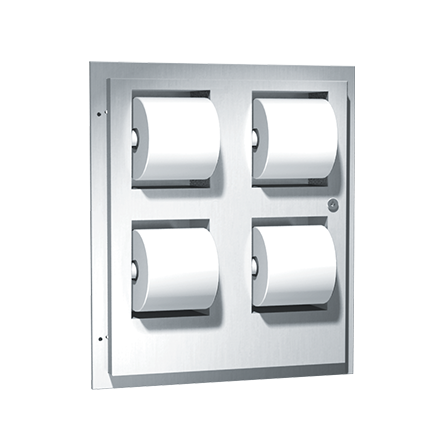 Holds and dispenses four (4) rolls standard or 1800 sheet 4-1/2″ x 5-1/4″ diameter [114 x Ø133] toilet paper. Cabinet door held closed with a tumbler lock. Toilet paper rolls feed freely until depleted and level of supply is constantly visible for low-level warning. Toilet paper rolls are serviced by unlocking and opening door. Locked door prevents inadvertent and unauthorized removal. Toilet paper spindles are carried in vandal resistant sub-frame accessible when door is opened. Cabinet receives theft and vandal resistant rollers for core-less toilet paper (by others).